Camouflage is popular why not promote with the best? RealTree & Mossy Oak Camo Hats with a logo. Camo hats custom embroidered with your company logo for promotional items and corporate gifts. Velcro closure, pre-curved visor with 6 rows of stitching, sewn eyelets & camo top button. An assortment of camo styles are available, click the blue link below to choose. Delivery from date of an actual order is usually 2 weeks. Price includes 10,000 stitches up to 4 colors in area 5 1/2" w x 2 1/4" h.
exceeding 10,000 stitches add $.50 each per 1,000 stitches. Optional side or back panel embroidery add $.50 each hat. Side or back embroidery is limited up to 5,000 stitches. Logos do require an Illustrator eps or pdf art file. In Arkansas we value our deer woods time and all the gear that goes with it. 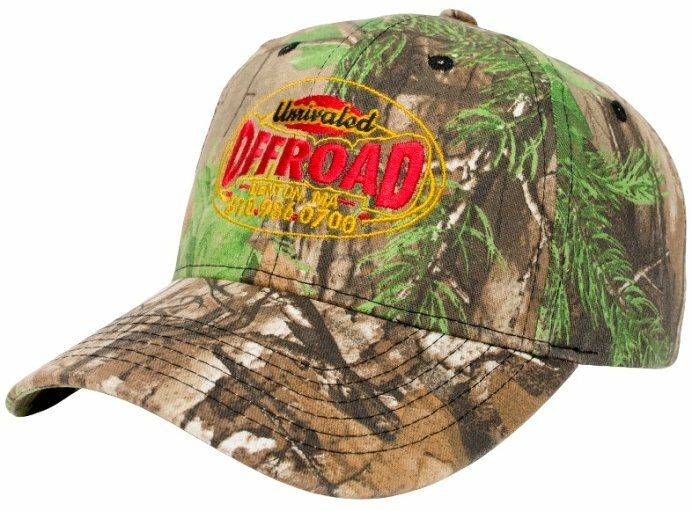 The Realtree hats we bought for our customers were a tremendous hit. Our logo looked great on both styles we purchased. I am a little late saying thank you as November was deer season. Still better late than never. we appreciate Promotional Items, Inc.